With Gaddafi as determined as ever to cling to power in Libya, tensions between Nato’s member states are becoming increasingly exposed. Four months ago, when David Cameron led the international call for military intervention in Libya, the general assumption within government circles was that Col Muammar Gaddafi, the Libyan dictator, would realise the game was up the moment Nato warplanes began bombing his forces. It did not seem to matter to Mr Cameron and his principal allies in the anti-Gaddafi campaign that the main purpose of UN Security Council resolution 1973, which provided the legal justification for military action, was to protect anti-Gaddafi rebels from the possibility of being massacred by forces loyal to their leader. Together with French President Nicolas Sarkozy and US President Barack Obama, Mr Cameron demanded that the military offensive would end only when Gaddafi was removed from power, so confident was he in the operation’s likely outcome. At a stroke an operation conceived on the basis of liberal interventionism had been transformed into one determined to achieve regime change. And it is to this end that Nato has undertaken a sophisticated bombing campaign designed as much to intensify the pressure on Gaddafi’s regime to give up its vice-like grip on power as to protect Libya’s civilian population. 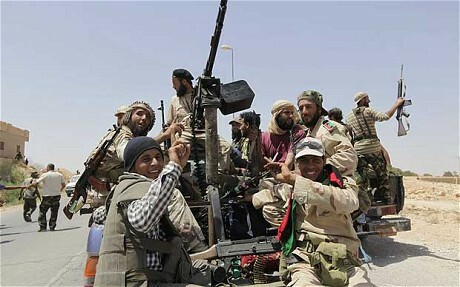 Apart from taking out Gaddafi’s air defences and launching thousands of raids against pro-Gaddafi forces, the campaign has increasingly targeted the regime itself, bombing the Libyan dictator’s Bab al-Azizia barracks and vital fuel supply lines. Yet, more than three months into the Nato offensive, Gaddafi remains as resolutely in power in Tripoli today as he was when the first bombs were dropped in March. In recent days, we have seen the extent of the support he continues to enjoy when thousands of his own supporters turned out in Tripoli to hear an address by the Libyan leader. Picture of the day: He is Allah, the Creator, the Maker, the Fashioner.